TUNE IN NOW – TILL 9PM!! Scientist Gretchen LeBuhn is trying to save the nation’s wild bee population. But to achieve her goal, she’s resorting to some unconventional means, namely the help of ordinary citizens from across the country. On Saturday 100,000 ‘citizen scientist’ volunteers will spend about 15 minutes counting the number of bees that visit “lemon queen” sunflowers they’ve planted following instructions on LeBuhn’s website,www.greatsunflower.com. Participants will monitor the flowers for bees twice monthly through the end of the summer, uploading the information into a central database. Studies have shown that pollinators affect 35 percent of the world’s crop production, but climate change and a little-understood phenomenon called “colony collapse disorder” are threatening honey bees, a key pollinator. Though researchers have reported a drastic decline in the populations of domesticated honeybees since at least 2006, the statistics on wild bees have remained more elusive. LeBuhn hopes the new data will help scientists identify where native bee populations are doing well and where they’re doing poorly. Hopefully, the hundreds of thousands of sunflowers planted by volunteers will have the added benefits of providing wild bees with an enriched and expanded habitat. Participants don’t need to know whether the bee they’re watching is a bumblebee, a carpenter bee or a honeybee, LeBuhn said, though a guide available on her website can help with identification. There are more than 4,000 different species of native bees in North America, according to Science Daily, but many of them have already disappeared. LeBuhn says that of the nine species of bumblebees known to live in the San Francisco area, researchers have only been able to find four of them in recent years. 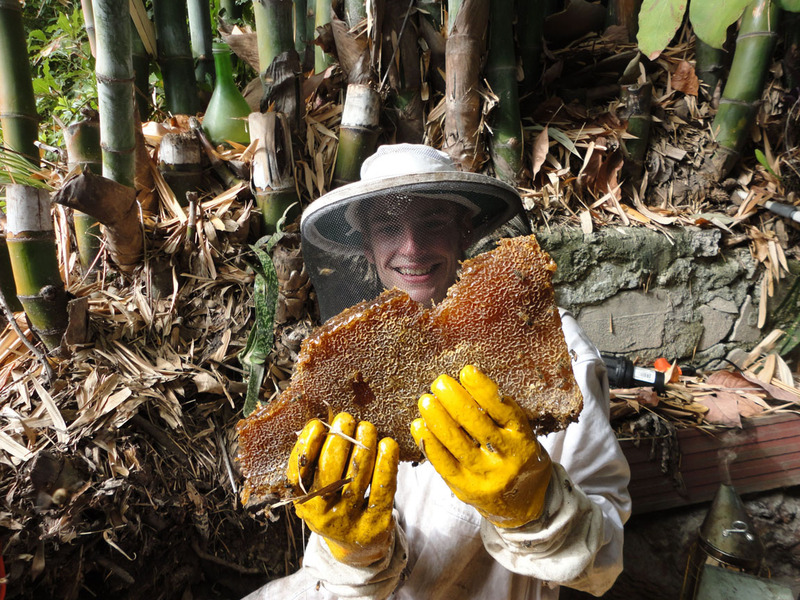 A call to the Bee Rescue Hotline sent us up to the Hollywood Hills to do a cut-out from an exterior garage wall. The homeowner said that the hive had been there for almost 20 years. There had also been two other hives on the property that other Backwards Beekeepers had removed. Knowing that the hive had been there such a long time, we were surprised to find just one area with brood comb and an equal amount of space for just honey. It was funny how the bees had set up the hive: on the left of one wall stud was the brood and on the right (between the next set of studs) was the honey. There was very little crossover. This hive was just barely hanging in there. Leah put the brood and bees into Rob’s handmade nucs and brought them to one of her queenless hives. We checked the hive the next day and there were some bees on the comb, but not many. There were also a bunch of bees left in the wall that didn’t want to go into the nuc box that I had left there, so I’ll need to move them on another night.